Our bodies call us to move and dance and play. We hear the gentle whisper and ignore it most of the time. What if we answered the call to dance and everything in our lives could change? 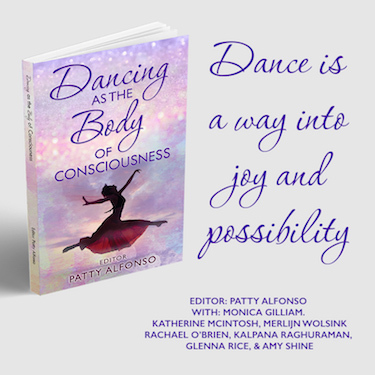 What is Dancing as the Body of Consciousness? 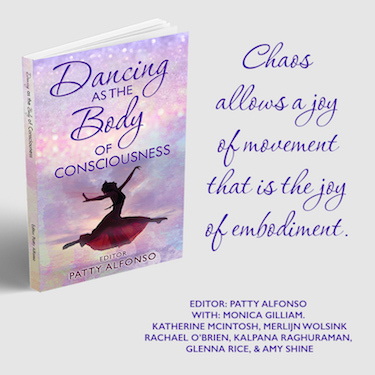 In this cutting-edge compilation, Patty Alfonso has gathered the stories of eight very different and fascinating people: Patty Alfonso, Dr. Glenna Rice, Merlijn Wolsink, Amy Shine, Rachael O'Brien, Kalpana Raghuraman, Monica Mata Gilliam and Katherine McIntosh. You’ll get an unprecedented glimpse into their lives as they share the ways in which dance and movement contribute to the creation of things they never imagined possible. What if dancing and movement could change the way you are in the world? 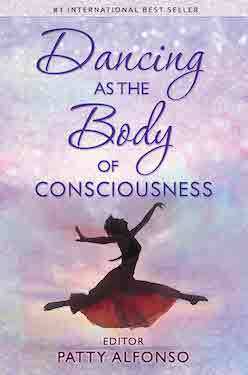 What if dancing and movement was one of the many paths in leading a more conscious life? What gifts await for you within your body? Patty is the creator of Pole Dancing for Consciousness™ and The Essence of You™. Her signature programs have invited her clients to have more ease, joy, pleasure and communion with their bodies. Exploring intimacy with Self, her kind and witty facilitation inspires her clients to melt away their limitations and open the door to new possibilities in their life with their bodies, business’ and relationships. Patty received her Bachelor’s Degree in Sociology from Emory University. She is certified as a Body/Mind Counselor and an Energy Healing Therapist. Patty’s desire to continue growing and empower her clients led her to the tools of Access Consciousness®, where she is a Certified Facilitator. A global traveler and facilitator, Patty currently resides in Los Angeles where she enjoys horseback riding, going to the movies, lounging by the pool, reading and creating her business with ease, joy and glory!